I skipped a few things that we did like Christmas and camping. (Yes, I know Christmas and 2015 are long gone.) We had a very fun Christmas in New Zealand. The day before Christmas, we made a cool gingerbread house. The next morning, Mark and I woke up very early in the morning and waited for a while. We could not open presents until Mom and Dad woke up. But then they woke up and we raced up stair asking, "Can we open presents now? Can we open presents now?" Finally everybody was up and Mark and I opened our presents. First we reached into our stockings. We pulled out candy canes. Then we reached back in and pulled out some cake erasers, toy crystals, and chocolate coins. If there was anything else, I don't remember what they were or even if I still have them. Mom and dad looked in their stockings and Dad pulled out a tiki magnet, and Mom pulled out a glass crystal necklace. Then we opened real presents. I got a bow and arrow, and a device called a Huawei Mediapad T17.0. Mark got a stuffed bunny and the same device as mine. We both got money from Uncle Andrew, Grandma and Grandpa, and Nana and Grandpa. It was really fun! We went camping in New Zealand, two or three months after Christmas. The first day I was so excited! That is, until I found out that we were going to be driving the whole day from Whangerei to Wellington. Then we waited in the middle of the night for the ferry. I literally only got a minute of sleep before the check-in guy came. Then I tried to get some sleep. No luck. The next morning, I had a meat pie for breakfast (I think they made it to the top back of my list then, because when you are camping meat pies are a delicacy--for me anyway) and I got excited because I thought we were not driving anymore. Oh, how I was wrong. We drove for six hours, and I thought we were never going to stop. But then we made it to camp, set up our tent (which proved to protect us from Dad's fatal snoring) and got bitten a million times by mosquitos. We had dinner and went to bed. Ok, let's fast-forward a little bit to the cool parts. We went to the Franz Joseph Glacier, and it was a lot of fun except that the glacier had receded quite a bit and it was a far walk. But it was very cool! We stopped in town and got ice cream and I got some cool kiwi bird key chains/bottle openers. Mark and I at the Franz Joseph Glacier. We went to Queenstown and went to the Skyline luge, and got the Jelly Belly ride, which means you got free Jelly Bellies. We looked at some jellybean art and left back to camp. Then we headed towards Mt. Aspiring. On our way there, we stopped at a place called Arrowtown, an old gold mining town from the gold rush in New Zealand. We panned for gold and got some (!) Only a little bit though. Panning for gold in Arrowtown. Then we saw Mt. Aspiring and it was huge. We set up camp, and went on a little walk. The next day we needed to go back home, so we packed up, and set off north. 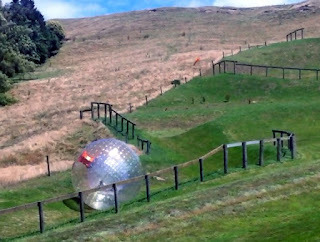 We went zorbing on the way back: rolling down a hill in a rubber ball filled with water! Sooner than I thought we stopped at the store, got dinner, and drove over to the ferry. We got on the ferry, and headed off to Northland. All too soon we were back on the boat working. Well, it was fun well it lasted. Hope you liked the things that I skipped on other posts! I don't know how I missed some of your earlier posts but I'm so glad I got a chance to read them because you really must have put in a lot of effort writing them. I liked the part about your dad's snoring because now you know what I put up with your grandpa's snoring.